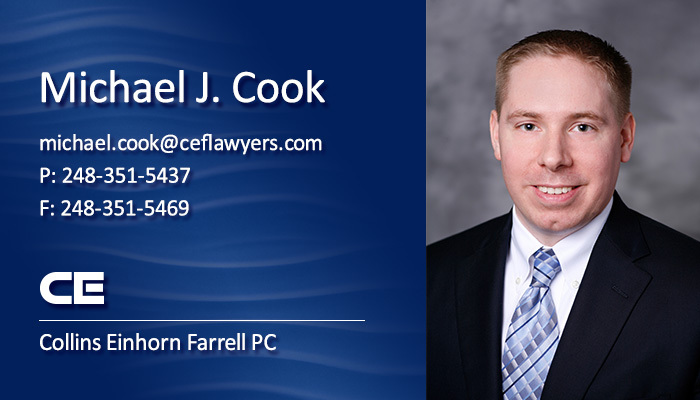 Michael J. Cook, a shareholder at Collins Einhorn Farrell PC, has published an article in The Michigan Defense Quarterly “Is Your Brief Conversational? It Should Be.” Legal briefs are often written to sound non-conversational, filled with old dead words and phrases such as “henceforth” and “wherefore.” By removing these dead words and phrases from your legal briefs, and making your brief sound more conversational, your argument will come across more clearly to your readers (i.e. judges and their law clerks). The full article begins on page 8 of The Michigan Defense Quarterly, which can be downloaded in its entirety by clicking here.